Dr. Samuel A. Mielcarski has been pursuing optimal health his whole life but discovered a raw food diet in his late 20s. Since then, this author, speaker, retreat host, physical therapist and Woodstock Fruit Festival pioneer has turned on thousands to the idea of adopting a complete lifestyle package to help them thrive in all they do. After participating in the Mr. Atlanta bodybuilding competition in 1998, Samuel, who earned a doctoral degree in physical therapy and is nicknamed Dr. SAM, fell ill with significant prostate and urogenital issues, fatigue, digestive complaints, lower-back pain and depression. He became a vegetarian and then vegan over the next two years and ultimately adopted a wholly raw vegan diet in 2000. All his ailments healed the same year. 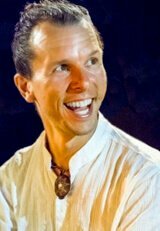 The key benefits Samuel experiences on a low-fat raw food diet are improved overall health, more energy, prolonged youth and faster recovery from workouts and stressful events. He’s also enjoyed sharper mental clarity and focus, increased compassion, spiritual enlightenment and “stronger loving relationships with myself, with Nature, with other people and with other species on this planet,” he said. 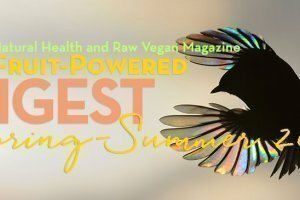 In recent years, Samuel has increasingly realized this diet is truly a “lifestyle.” His favorite aspects of this lifestyle are convenience, connection to the earth and other raw fooders, taste, adventure and seasonal variety. 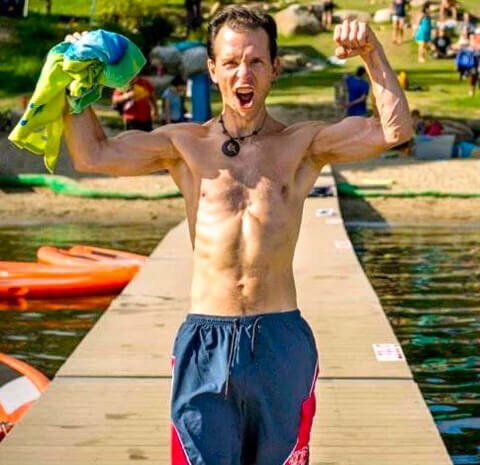 Even though 41 and after being raw vegan for almost 15 years, Samuel, who lives outside Atlanta, Georgia, most of the year, said that he continues to experience ever-increasing vitality and that he has not yet peaked. Samuel’s physical activity certainly helps keep him reaching new heights. His workouts, which put the focus on “quality” over “quantity” of exercise, include bodyweight calisthenics, resistance training, hiking, Qigong and light cardiovascular exercises. Samuel views exercise as a vital “nutrient” the body needs not only to survive but thrive. 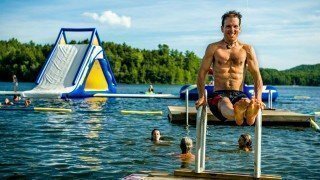 “I like to keep exercise both fun and purposeful so as to stay dedicated as well prevent injuries and increase my overall survival and durability,” Samuel said. His fruit-rich diet has taken his athletic achievements to highs. Samuel’s diet encompasses fruits, vegetables, nuts, seeds, sprouts, legumes, tubers, herbs, grasses, grains and wild edibles. Total fat calories run less than 20 percent most days, he said. On an active day, Samuel might enjoy a quart of green juice, including an apple or pear, and/or 8 to 16 ounces of fresh coconut water in the morning. Next would be a smoothie with 10 bananas and some dates, carob or vanilla and possibly some barley grass juice powder. 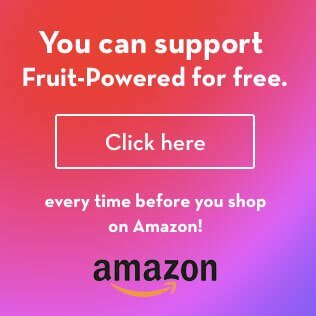 Finally, Samuel would consume 800 to 1,000 or more calories of seasonal fruit during the last meal followed by a salad and/or an avocado or some nuts or seeds. Among the fruits Samuel enjoys the most are dates, figs, durian, mangos, bananas, mamey sapote, melons, jackfruit, persimmons, berries “and the list goes on!” he said. With greens, he favors celery, romaine and butter lettuce, arugula, spinach and sunflower sprouts. For juicing, however, Samuel reaches for lettuces, celery, cucumber, spinach, Swiss chard, kale, collards and broccoli. He eats foods high in fat—avocado, nuts, seeds, coconut and durian—almost daily but not in excessive amounts. Dr. SAM has more than 1,000 feet of gardening space in his back yard along with more than 30 fruit trees. 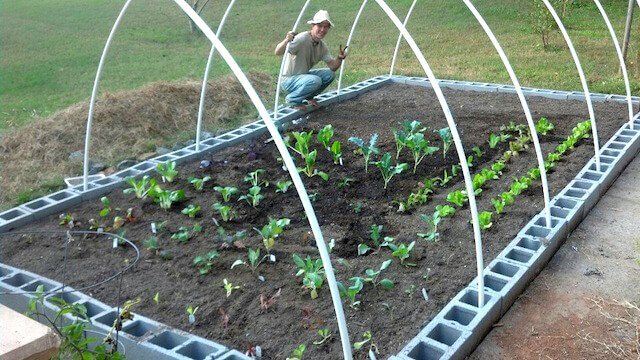 Samuel loves to spend time growing his own food. He has carved out more than 1,000 square feet of garden space and has 30-plus fruit trees planted in his backyard garden and orchard. Samuel was exposed to the “principles of health,” as he calls them, and power of rehabilitation at an early age. His mother and father were both health and science teachers, physical education majors and standout athletes. Samuel was born with twisted hips and had a brace on his legs to reseat his hips. He also observed and helped his brother do corrective exercises for scoliosis. At 10, Samuel began playing contact sports and lifting weights and said he began requiring physical therapy. In junior high, Samuel injured his right knee playing basketball, and in high school, he injured his other knee. Dr. Samuel Mielcarski leads an exercise class. Samuel assists clients suffering from physical accidents and traumas, orthopedic issues as well as those with general wellness needs. 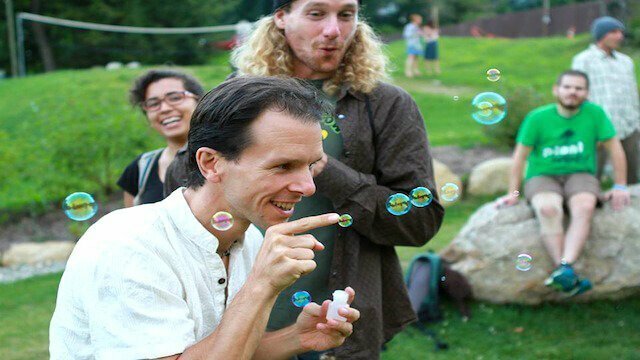 Samuel has operated his RAW-habilitation retreats for almost six years. 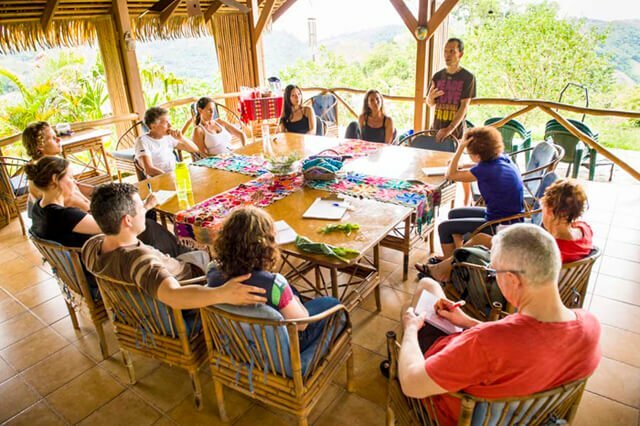 Participants enjoy waterfalls, jungle hikes, exotic beaches, tropical fruits and other raw food delights. They also engage in empowering lectures, classes and corrective exercise to eliminate pain and improve fitness. “Many people not only transform their health while at the retreat but also feel much more confident about how to succeed in managing their health long-term when they return home as well,” he said, adding that long-lasting friendships between health seekers are forged. Samuel supplements with Vitamins B12 and D, the latter in the winter only, depending on where he is living. He supplements with iodine and barley grass juice powder “as a broad-range mineral supplement,” he said. He also supplements with Vitamin C during stressful times. He uses blood and urine tests, clinical correlation and tuning in to his body to determine which supplements to take. Samuel’s two books—Dr. 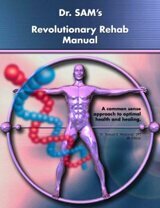 SAM’s Revolutionary Rehab Manual and Feel Good Now!—were inspired by his desire to help others boost their health along with his own health and healing journey. The former book is targeted at laypersons and clinicians who want optimal healing results when recovering from an injury or illness and includes an overview of the health-disease spectrum, highlights a sensible rehabilitation approach and more. Feel Good Now! : When It Comes to Better Health, There Really Is a ‘Quick Fix’ lays out the “art of health” as opposed to overwhelming readers with complex science. 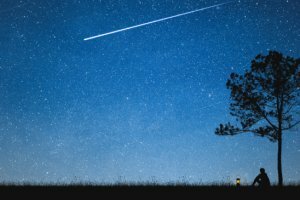 “It provides a common-sense approach to feeling better as well as a fresh perspective on how to improve your health quickly, easily and permanently!” he said. Listen to and trust your body—it will guide you correctly along the way. Don’t be too dogmatic. Raw food is a great diet but a bad religion. For example, if you need to take supplements in addition to your diet, then take them! Don’t just focus on food! All factors of health (wholesome food, fresh air, clean water, sunshine, rest, activity, hygiene, love) deserve equal consideration. This is a “lifestyle,” not just a diet! Get help—surround yourself with others who can love and support you on this journey so that you’re not going through it alone. Take each day one at a time. The goal is to be 100 percent happy and healthy, not necessarily 100% raw. Keep meals simple most of the time and avoid eating lots of gourmet raw foods, especially ones that contain lots of fat and sugar together. Get enough nutrients as well as calories each day. Eat organic, locally and seasonally. Eat mindfully. Don’t multitask your eating endeavors. Be present and enjoy your food. Fill your life up with more than just food! Keep track of what you’re eating and how you’re feeling. Health is a product of healthful living. You can only experience good health to the degree that you live healthfully. Optimal health will be attainable only if it’s a high priority in your life. Avoid getting trapped in the complex “science of health” and keep health matters simple by sticking to just the simple health basics that work. Follow a whole “system of health,” not just one aspect of it. Always be willing to keep learning, evolving and “tweaking” your health regimen but don’t “overhaul it” unless that is what is truly needed. Your body will guide you correctly most of the time. When or if it doesn’t, ask for help. A decade down the road, Samuel envisions himself continuing to be a leader in the fields of health and wellness, empowering others via speaking, writing, retreats, health products and consulting. 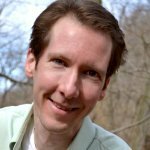 “I have a personal and profession goal of helping to change the consciousness of the physical therapy profession by teaching my ‘RAW-habilitation’ concept to other physical therapists (as well as other health-care professionals and lay people) who are open to learning a new and better way to provide patient-client care and/or have the desire to change the health-care system overall for the better,” he said. Visit Dr. SAM’s website, retreat website, YouTube channel and Facebook and LinkedIn pages. Dr. SAM launched Bad Health Be Gone: A “Quick Fix” Blueprint for Better Health! in summer 2015. This program includes videos, a questionnaire, audio files and written transcripts, and a comprehensive workbook. 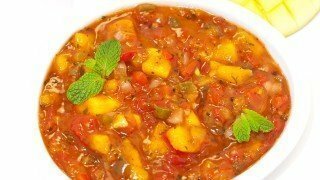 Explore all Dressing Recipes to Salsa Recipes! Great article on a great guy. I love Dr Sam and he has helped me out tremendously with corrective exercises and hands on physical therapy.